ST provided this graphic but I my thoughts is over the remarks of analysts on this proposed change to our system. The proposed move may also further deter a segment of voters from voting for the Opposition, said National University of Singapore political scientist Hussin Mutalib, as they know that “a sizeable number of them (Opposition members) will be in Parliament anyway”. Now if NCMPs also get the same voting rights as elected MPs won't they begin to see themselves as sort of elected MPs as well? They didn't win but they were ahead of all the losers. This would legitimize their grassroots presence in the wards they polled well but not enough to win. In many instances the margin of loss might not be significant too. There is nothing to stop them from working to serve those who had supported them. They likely polled from 40 to 49%. If this is the outcome then Prof Mutalib logic would now work in reverse. Full voting rights is not insignificant at all. Analysts seem to have forgotten the legitimacy that would give to NCMPs going forward. This is definitely a double edged sword for the governing party. It is good that the PM is not making the job easier for his party. They need to fight hard to win. This must also be seen as strengthening the opposition parties. 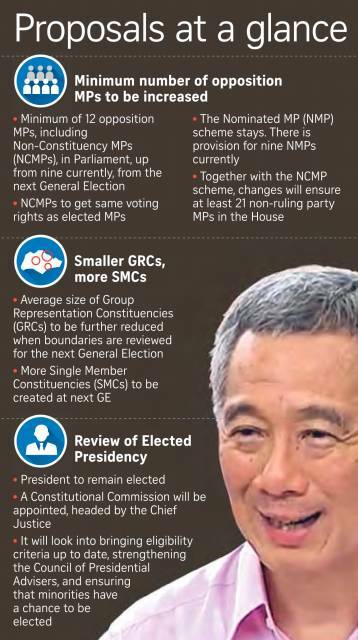 This proposed change may or may not be a double-edged sword for PAp. I think they know the psychic of most sporeans - that most want a Pap govt but also want opposition. while there are several reasons for PAP winning 69.9 last year, one contributing factor was that all seats were contested and some sporeans worried they would be kicked. out. none of the opposition parties can govern better for a while yet and we (PAP, sporeans and opposition)know that. There is some cunning in PAP increasing number of NCMPs and giving them voting rights (think it is not altruistic) this can serve to help voters think 12 opposition members and with equal voting rights may be sufficient, at least for the medium term so their voting decision may be tuned to this. PAP can then be more confident that they will retain the power to govern. Of course, it also allows the NCMPs to hone their parliamentary skills but when I looked at the WP members who were MPs from 2011, not all had their skills honed. Conversely, some turned out to be disappointing (eg. Chen Show Mao)and some were kicked out (Jenn and Lee Lilian). One can argue that their being kicked out was due to gerrymeandering by PAP but had these two been strong on their own, they would have been able to retain their seats; and Lee Lilian was full-time MP so what happened. I know she was MP for just about 2 - 3 yrs but it should have allowed her to sink some roots surely. I personally dont think that NCMPs should be given equal voting rights. They lost whatever the margin. PSLE: What if we have learned to love our misery? Is the Zika virus here already? Were the deported Banglas terrorists? What happened to guys' pants?